I love sketches, it's a great way to get your creativity going! This week JustRite is sponsoring the sketch at 2Sketches4You, and you have a chance to win a $100 JustRite Gift Certificate! How cool is that! Grab your stamps and play along! Here's my take on this weeks sketch - I rotated it and put the sentiment from Autumn Blessings on the right side. 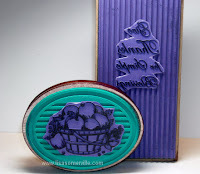 Even though the sentiment is an Oval, I trimmed it and placed it on the Large Horizontal Wood Stamper, using a SAMJ, I stamped it in Black on Vanilla card stock. It's a great way to get dual use out of your images and sentiments! 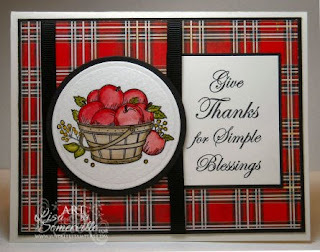 The basket of Apples is also from the Autumn Blessings Set - again it's from an Oval Set, but I trimmed around the image, placed it on the 2-1/4" x 3-1/16" Wood Stamper, stamped in Black on Watercolor Paper, then cut using Spellbinders Circle Dies. I colored my image using the Marker Watercoloring Technique. beautiful - I love looking at your water color projects! I love how you turned the sketch on its side! This is fabulous!